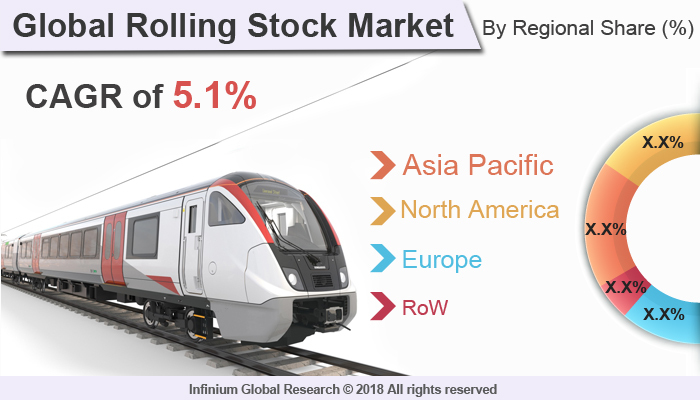 A recent report published by Infinium Global Research on rolling stock market provides an in-depth analysis of segments and sub-segments in global as well as the regional rolling stock market. The study also highlights the impact of drivers, restraints, and macro indicators on the global and regional rolling stock market over the short term as well as long term. The report is a comprehensive presentation of trends, forecast and dollar values of the global rolling stock market. According to the report, the global rolling stock market is projected to grow at a CAGR of 5.1% over the forecast period of 2018-2024. Rolling stock is the term used for self-propelled transportation equipment that moves on a railway track. The wheeled vehicles collectively used on a railway, including the locomotives, passenger coaches, freight wagons, guard's vans, etc. The rolling stocks are both powered and unpowered vehicles. Rolling stocks are mostly used in the rail transport industry. In some countries such as the U.S., rolling stock term is also referred for the wheeled vehicles used by for businesses on roadways. The world’s transportation infrastructure is growing rapidly. Several countries are more focused on the improvements of the public transportation systems, especially the rail infrastructure. The rolling stocks are vehicles or the systems that offer faster, safer, and well suited for carrying heavy or bulky goods with the high cost-effectiveness are driving the growth of rolling stocks through the various countries. The rolling stocks are been increasingly adopted in the public transportation sectors in order to reduce traffic congestion, which is driving the growth for the rolling stock. Additionally, the rolling stocks such as Locomotives are specifically used in the transportation of numerous goods such as oil, construction equipment, agriculture products, and many other industrial goods. The high capacity, speed, and economy offered by the rolling stock are majorly used in the goods transportations. The growing use of rolling stocks in industrial applications has driven the demand for the rolling stock. However, the high initial investments are restraining the growth of rolling stocks market. The use of specific light weighted components is growing in the rail manufacturing to expand improve fuel efficiency and reliability of rail vehicles. Furthermore, the various companies, as well as government, are investing more into the rolling stocks in order to expand transportation capacity is expected to boost the demand for the rolling stock are projected to create several growth opportunities in the rolling stocks market. Among the regions, Asia Pacific is accounted for the maximum market share in the roller stock market, in 2017 and it is expected to dominate over the forecast period. The high investments in rail transportation and adoption of rolling sticks in rail transport industries are the factor driving the growth of rolling stocks market in the Asia Pacific region. In addition, the high adoption of metro and electric trains among China, Indian and other countries are expected to create numerous opportunities in the rolling stacks market. The report on global rolling stock market covers segments such as product type, component, and application. On the basis of product type, the global rolling stock market is categorized into locomotives, coaches, wagons, and rapid transit. On the basis of the component, the global rolling stock market is categorized into pantograph, axle, passenger information system, auxiliary power system, air conditioning system, and traction motor. On the basis of application, the global rolling stock market is categorized into passenger transportation, and freight. The report provides regional analysis covering geographies such as North America, Europe, Asia-Pacific, and Rest of the World. In this section, the key trends and market size for each geography are provided over the period of 2016-2024. The countries covered in the North America region include the U.S., Canada, and Mexico; while the Asia-Pacific region includes countries such as China, Japan, India, South Korea, Malaysia, and among others. Moreover, Germany, U.K., France, Spain, and Rest of Europe(includes eastern European countries, western European countries & CIS countries) are the major markets included in the European region. The U.S. drives the growth in the North America region, as it is the largest market in the region. In the Asia-pacific region, rapid industrial growth in India and China offer substantial potential for the growth in the rolling stock market. As a result, the APAC region is projected to experience growth at a CAGR of x.x% over the forecast period 2018-2024. The report provides profiles of the companies in the global rolling stock market such as CRRC, Bombardier, Siemens, Alstom, General Electric, Kawasaki Heavy Industries, Hyundai Rotem, Mitsubishi Heavy Industries, Talgo, and Stadler. The report provides deep insights into the demand forecasts, market trends, and micro and macro indicators. In addition, this report provides insights into the factors that are driving and restraining the global rolling stock market. Moreover, The IGR-Growth Matrix analysis given in the report brings an insight into the investment areas that existing or new market players can consider. The report provides insights into the market using analytical tools such as Porter's five forces analysis and DRO analysis of rolling stock market. Moreover, the study highlights current market trends and provides forecast from 2018-2024. We also have highlighted future trends in the rolling stock market that will affect the demand during the forecast period. Moreover, the competitive analysis given in each regional market brings an insight into the market share of the leading players. This report will help manufacturers, suppliers, and distributors of the rolling stock market to understand the present and future trends in this market and formulate their strategies accordingly.